Finance for $301 per month at 5.19% APR for 72 months with $2,449 down payment. Payment expires on 04/30/19. Estimated Finance payment based upon 5.19% APR for 72 months, with a down payment of $2,449. Excludes title, taxes, registration, and license fees. Some customers will not qualify. See your authorized dealer for complete details on this and other offers. Residency restrictions may apply. Lease for $197/month for 36 months with $2,449 due at signing including $0 Security Deposit and 10,000 miles per year. Payment expires on 04/30/19. Estimated Lease payment based on 36 months and $2,449 due at lease signing. Cash due at signing includes $5,533 capitalization cost reduction, which includes $650 acquisition fee, plus a required security deposit of $0, and first month's lease payment of $197. Excludes title, taxes, registration, and license fees. Total monthly payments equal $12,619. Mileage charge of $0.20 per mile over 10,000 miles. Not all consumers will qualify. Residency restrictions may apply. Finance for $301 per month at 5.19% APR for 72 months with $2,450 down payment. Payment expires on 04/30/19. Estimated Finance payment based upon 5.19% APR for 72 months, with a down payment of $2,450. Excludes title, taxes, registration, and license fees. Some customers will not qualify. See your authorized dealer for complete details on this and other offers. Residency restrictions may apply. Lease for $197/month for 36 months with $2,450 due at signing including $0 Security Deposit and 10,000 miles per year. Payment expires on 04/30/19. Estimated Lease payment based on 36 months and $2,450 due at lease signing. Cash due at signing includes $5,533 capitalization cost reduction, which includes $650 acquisition fee, plus a required security deposit of $0, and first month's lease payment of $197. Excludes title, taxes, registration, and license fees. Total monthly payments equal $12,621. Mileage charge of $0.20 per mile over 10,000 miles. Not all consumers will qualify. Residency restrictions may apply. Finance for $301 per month at 5.19% APR for 72 months with $2,454 down payment. Payment expires on 04/30/19. Estimated Finance payment based upon 5.19% APR for 72 months, with a down payment of $2,454. Excludes title, taxes, registration, and license fees. Some customers will not qualify. See your authorized dealer for complete details on this and other offers. Residency restrictions may apply. Lease for $198/month for 36 months with $2,454 due at signing including $0 Security Deposit and 10,000 miles per year. Payment expires on 04/30/19. Estimated Lease payment based on 36 months and $2,454 due at lease signing. Cash due at signing includes $5,537 capitalization cost reduction, which includes $650 acquisition fee, plus a required security deposit of $0, and first month's lease payment of $198. Excludes title, taxes, registration, and license fees. Total monthly payments equal $12,635. Mileage charge of $0.20 per mile over 10,000 miles. Not all consumers will qualify. Residency restrictions may apply. Finance for $310 per month at 5.19% APR for 72 months with $2,607 down payment. Payment expires on 04/30/19. Estimated Finance payment based upon 5.19% APR for 72 months, with a down payment of $2,607. Excludes title, taxes, registration, and license fees. Some customers will not qualify. See your authorized dealer for complete details on this and other offers. Residency restrictions may apply. Lease for $220/month for 36 months with $2,607 due at signing including $0 Security Deposit and 10,000 miles per year. Payment expires on 04/30/19. Estimated Lease payment based on 36 months and $2,607 due at lease signing. Cash due at signing includes $5,487 capitalization cost reduction, which includes $650 acquisition fee, plus a required security deposit of $0, and first month's lease payment of $220. Excludes title, taxes, registration, and license fees. Total monthly payments equal $13,394. Mileage charge of $0.20 per mile over 10,000 miles. Not all consumers will qualify. Residency restrictions may apply. Finance for $310 per month at 5.19% APR for 72 months with $2,611 down payment. Payment expires on 04/30/19. Estimated Finance payment based upon 5.19% APR for 72 months, with a down payment of $2,611. Excludes title, taxes, registration, and license fees. Some customers will not qualify. See your authorized dealer for complete details on this and other offers. Residency restrictions may apply. Lease for $220/month for 36 months with $2,611 due at signing including $0 Security Deposit and 10,000 miles per year. Payment expires on 04/30/19. Estimated Lease payment based on 36 months and $2,611 due at lease signing. Cash due at signing includes $5,492 capitalization cost reduction, which includes $650 acquisition fee, plus a required security deposit of $0, and first month's lease payment of $220. Excludes title, taxes, registration, and license fees. Total monthly payments equal $13,410. Mileage charge of $0.20 per mile over 10,000 miles. Not all consumers will qualify. Residency restrictions may apply. Finance for $328 per month at 5.19% APR for 72 months with $2,743 down payment. Payment expires on 04/30/19. Estimated Finance payment based upon 5.19% APR for 72 months, with a down payment of $2,743. Excludes title, taxes, registration, and license fees. Some customers will not qualify. See your authorized dealer for complete details on this and other offers. Residency restrictions may apply. Lease for $235/month for 36 months with $2,743 due at signing including $0 Security Deposit and 10,000 miles per year. Payment expires on 04/30/19. Estimated Lease payment based on 36 months and $2,743 due at lease signing. Cash due at signing includes $5,409 capitalization cost reduction, which includes $650 acquisition fee, plus a required security deposit of $0, and first month's lease payment of $235. Excludes title, taxes, registration, and license fees. Total monthly payments equal $13,837. Mileage charge of $0.20 per mile over 10,000 miles. Not all consumers will qualify. Residency restrictions may apply. Finance for $342 per month at 5.19% APR for 72 months with $2,847 down payment. Payment expires on 04/30/19. Estimated Finance payment based upon 5.19% APR for 72 months, with a down payment of $2,847. Excludes title, taxes, registration, and license fees. Some customers will not qualify. See your authorized dealer for complete details on this and other offers. Residency restrictions may apply. Lease for $238/month for 36 months with $2,847 due at signing including $0 Security Deposit and 10,000 miles per year. Payment expires on 04/30/19. Estimated Lease payment based on 36 months and $2,847 due at lease signing. Cash due at signing includes $6,010 capitalization cost reduction, which includes $650 acquisition fee, plus a required security deposit of $0, and first month's lease payment of $238. Excludes title, taxes, registration, and license fees. Total monthly payments equal $14,547. Mileage charge of $0.20 per mile over 10,000 miles. Not all consumers will qualify. Residency restrictions may apply. Finance for $349 per month at 5.19% APR for 72 months with $2,908 down payment. Payment expires on 04/30/19. Lease for $225/month for 36 months with $2,908 due at signing including $0 Security Deposit and 10,000 miles per year. Payment expires on 04/30/19. Estimated Lease payment based on 36 months and $2,908 due at lease signing. Cash due at signing includes $6,583 capitalization cost reduction, which includes $650 acquisition fee, plus a required security deposit of $0, and first month's lease payment of $225. Excludes title, taxes, registration, and license fees. Total monthly payments equal $14,667. Mileage charge of $0.20 per mile over 10,000 miles. Not all consumers will qualify. Residency restrictions may apply. Finance for $350 per month at 5.19% APR for 72 months with $2,918 down payment. Payment expires on 04/30/19. Estimated Finance payment based upon 5.19% APR for 72 months, with a down payment of $2,918. Excludes title, taxes, registration, and license fees. Some customers will not qualify. See your authorized dealer for complete details on this and other offers. Residency restrictions may apply. Lease for $226/month for 36 months with $2,918 due at signing including $0 Security Deposit and 10,000 miles per year. Payment expires on 04/30/19. Estimated Lease payment based on 36 months and $2,918 due at lease signing. Cash due at signing includes $6,593 capitalization cost reduction, which includes $650 acquisition fee, plus a required security deposit of $0, and first month's lease payment of $226. Excludes title, taxes, registration, and license fees. Total monthly payments equal $14,705. Mileage charge of $0.20 per mile over 10,000 miles. Not all consumers will qualify. Residency restrictions may apply. Finance for $363 per month at 5.99% APR for 72 months with $2,702 down payment. Payment expires on 04/30/19. Estimated Finance payment based upon 5.99% APR for 72 months, with a down payment of $2,702. Excludes title, taxes, registration, and license fees. Some customers will not qualify. See your authorized dealer for complete details on this and other offers. Residency restrictions may apply. Lease for $231/month for 36 months with $2,702 due at signing including $0 Security Deposit and 10,000 miles per year. Payment expires on 04/30/19. Estimated Lease payment based on 36 months and $2,702 due at lease signing. Cash due at signing includes $5,572 capitalization cost reduction, which includes $650 acquisition fee, plus a required security deposit of $0, and first month's lease payment of $231. Excludes title, taxes, registration, and license fees. Total monthly payments equal $13,864. Mileage charge of $0.20 per mile over 10,000 miles. Not all consumers will qualify. Residency restrictions may apply. Finance for $364 per month at 5.99% APR for 72 months with $2,706 down payment. Payment expires on 04/30/19. Estimated Finance payment based upon 5.99% APR for 72 months, with a down payment of $2,706. Excludes title, taxes, registration, and license fees. Some customers will not qualify. See your authorized dealer for complete details on this and other offers. Residency restrictions may apply. Lease for $231/month for 36 months with $2,706 due at signing including $0 Security Deposit and 10,000 miles per year. Payment expires on 04/30/19. Estimated Lease payment based on 36 months and $2,706 due at lease signing. Cash due at signing includes $5,576 capitalization cost reduction, which includes $650 acquisition fee, plus a required security deposit of $0, and first month's lease payment of $231. Excludes title, taxes, registration, and license fees. Total monthly payments equal $13,879. Mileage charge of $0.20 per mile over 10,000 miles. Not all consumers will qualify. Residency restrictions may apply. Finance for $368 per month at 5.19% APR for 72 months with $3,048 down payment. Payment expires on 04/30/19. Estimated Finance payment based upon 5.19% APR for 72 months, with a down payment of $3,048. Excludes title, taxes, registration, and license fees. Some customers will not qualify. See your authorized dealer for complete details on this and other offers. Residency restrictions may apply. Lease for $241/month for 36 months with $3,048 due at signing including $0 Security Deposit and 10,000 miles per year. Payment expires on 04/30/19. Estimated Lease payment based on 36 months and $3,048 due at lease signing. Cash due at signing includes $6,708 capitalization cost reduction, which includes $650 acquisition fee, plus a required security deposit of $0, and first month's lease payment of $241. Excludes title, taxes, registration, and license fees. Total monthly payments equal $15,351. Mileage charge of $0.20 per mile over 10,000 miles. Not all consumers will qualify. Residency restrictions may apply. Finance for $369 per month at 5.19% APR for 72 months with $3,056 down payment. Payment expires on 04/30/19. Estimated Finance payment based upon 5.19% APR for 72 months, with a down payment of $3,056. Excludes title, taxes, registration, and license fees. Some customers will not qualify. See your authorized dealer for complete details on this and other offers. Residency restrictions may apply. Lease for $241/month for 36 months with $3,056 due at signing including $0 Security Deposit and 10,000 miles per year. Payment expires on 04/30/19. Estimated Lease payment based on 36 months and $3,056 due at lease signing. Cash due at signing includes $6,715 capitalization cost reduction, which includes $650 acquisition fee, plus a required security deposit of $0, and first month's lease payment of $241. Excludes title, taxes, registration, and license fees. Total monthly payments equal $15,379. Mileage charge of $0.20 per mile over 10,000 miles. Not all consumers will qualify. Residency restrictions may apply. Finance for $383 per month at 5.19% APR for 72 months with $3,180 down payment. Payment expires on 04/30/19. Estimated Finance payment based upon 5.19% APR for 72 months, with a down payment of $3,180. Excludes title, taxes, registration, and license fees. Some customers will not qualify. See your authorized dealer for complete details on this and other offers. Residency restrictions may apply. Lease for $232/month for 36 months with $3,180 due at signing including $0 Security Deposit and 10,000 miles per year. Payment expires on 04/30/19. Estimated Lease payment based on 36 months and $3,180 due at lease signing. Cash due at signing includes $7,148 capitalization cost reduction, which includes $650 acquisition fee, plus a required security deposit of $0, and first month's lease payment of $232. Excludes title, taxes, registration, and license fees. Total monthly payments equal $15,497. Mileage charge of $0.20 per mile over 10,000 miles. Not all consumers will qualify. Residency restrictions may apply. Finance for $387 per month at 5.19% APR for 72 months with $3,183 down payment. Payment expires on 04/30/19. Estimated Finance payment based upon 5.19% APR for 72 months, with a down payment of $3,183. Excludes title, taxes, registration, and license fees. Some customers will not qualify. See your authorized dealer for complete details on this and other offers. Residency restrictions may apply. Lease for $244/month for 36 months with $3,183 due at signing including $0 Security Deposit and 10,000 miles per year. Payment expires on 04/30/19. Estimated Lease payment based on 36 months and $3,183 due at lease signing. Cash due at signing includes $8,040 capitalization cost reduction, which includes $650 acquisition fee, plus a required security deposit of $0, and first month's lease payment of $244. Excludes title, taxes, registration, and license fees. Total monthly payments equal $16,817. Mileage charge of $0.20 per mile over 10,000 miles. Not all consumers will qualify. Residency restrictions may apply. Finance for $402 per month at 5.19% APR for 72 months with $3,320 down payment. Payment expires on 04/30/19. Estimated Finance payment based upon 5.19% APR for 72 months, with a down payment of $3,320. Excludes title, taxes, registration, and license fees. Some customers will not qualify. See your authorized dealer for complete details on this and other offers. Residency restrictions may apply. Lease for $253/month for 36 months with $3,320 due at signing including $0 Security Deposit and 10,000 miles per year. Payment expires on 04/30/19. Estimated Lease payment based on 36 months and $3,320 due at lease signing. Cash due at signing includes $7,068 capitalization cost reduction, which includes $650 acquisition fee, plus a required security deposit of $0, and first month's lease payment of $253. Excludes title, taxes, registration, and license fees. Total monthly payments equal $16,156. Mileage charge of $0.20 per mile over 10,000 miles. Not all consumers will qualify. Residency restrictions may apply. Finance for $424 per month at 5.19% APR for 72 months with $3,440 down payment. Payment expires on 04/30/19. Estimated Finance payment based upon 5.19% APR for 72 months, with a down payment of $3,440. Excludes title, taxes, registration, and license fees. Some customers will not qualify. See your authorized dealer for complete details on this and other offers. Residency restrictions may apply. Lease for $262/month for 36 months with $3,440 due at signing including $0 Security Deposit and 10,000 miles per year. Payment expires on 04/30/19. Estimated Lease payment based on 36 months and $3,440 due at lease signing. Cash due at signing includes $7,679 capitalization cost reduction, which includes $650 acquisition fee, plus a required security deposit of $0, and first month's lease payment of $262. Excludes title, taxes, registration, and license fees. Total monthly payments equal $17,090. Mileage charge of $0.20 per mile over 10,000 miles. Not all consumers will qualify. Residency restrictions may apply. Don Moore Hyundai stocks the full line of new Hyundai cars and SUVs at our Owensboro dealership near Hartford. You'll be hard pressed to find a bigger selection of cars in Greenville, Madisonville, KY, or Evansville, IN. 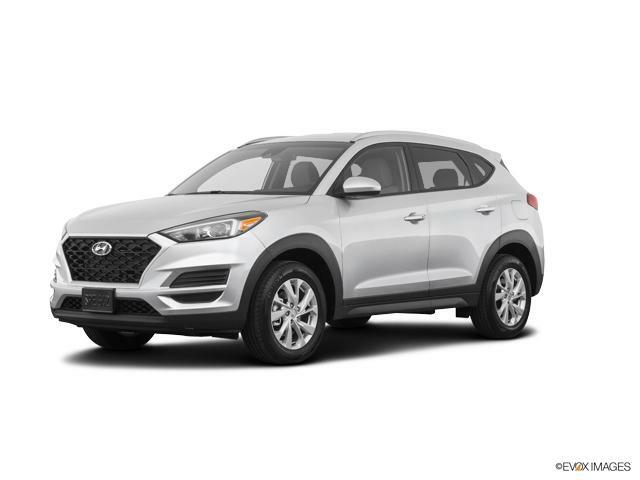 To refine your 2019 Hyundai Tucson car search further, please use the selections at the upper left. Whether you're looking for a car, truck, SUV, or van, we'll have the right one for you. Not finding your perfect match? If you don't see the vehicle or options you are looking for, or for more information, please call us today at (855) 368-1826 or contact us online.